Ruiz, M.; Colomer , J.; Colprim, J.; Meléndez, J. In this work, a combination between Multivariate Statistical Process Control (MSPC) and an automatic classification algorithm is developed to application in Waste Water Treatment Plant. Multiway Principal Component Analysis is used as MSPC method. The goal is to create a model that describes the batch direction and helps to fix the limits used to determine abnormal situations. Then, an automatic classification algorithm is used to situation assessment of the process. Ruiz, M. [et al.]. 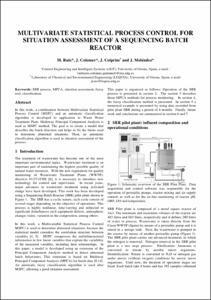 Multivariate statistical process control for situation assessment of a sequencing batch reactor. A: International Conference on Control. "Proceedings of the Control 2004 conference, University of Bath, UK 6-9 September 2004". Bath: 2004.